Twitter had already been written off by many people in the past. It was dubbed a failing business model; online experts predicted a quick take-over by Facebook and found the service to be basically useless. Despite all of these allegations, the micro-blogging service from California has become immensely popular. AndroidPIT has also become a dedicated tweeter. For those of you unfamiliar with our Twitter, check out our account here. Quite a few Twitter clients are already out there on the market some of which we have already tested. Here’s yet another one I got my hands on. For those of you interested in Twitter, find out what Touiteur can do for you in our test. First off, you might ask yourself “What’s the point of Twitter?”. The quick answer is: it depends on what you plan to do with it. Personally, I have two main reasons for using Twitter. First, I generally like to keep myself well-informed. Second, this online service has become an extremely important means of communication between AndroidPIT and out readers. Well over 3,000 people are following us online by reading our tweets to keep up-to-date on what’s happening around AndroidPIT. 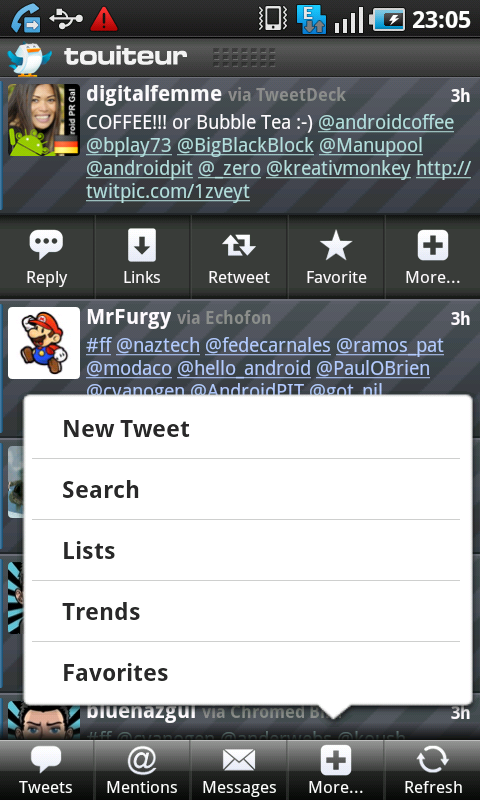 Twitter is a vital tool for us here at AndroidPIT. More and more companies are realizing this potential and opening up their own Twitter accounts. Tweets: a normal timeline of all your followed tweets. 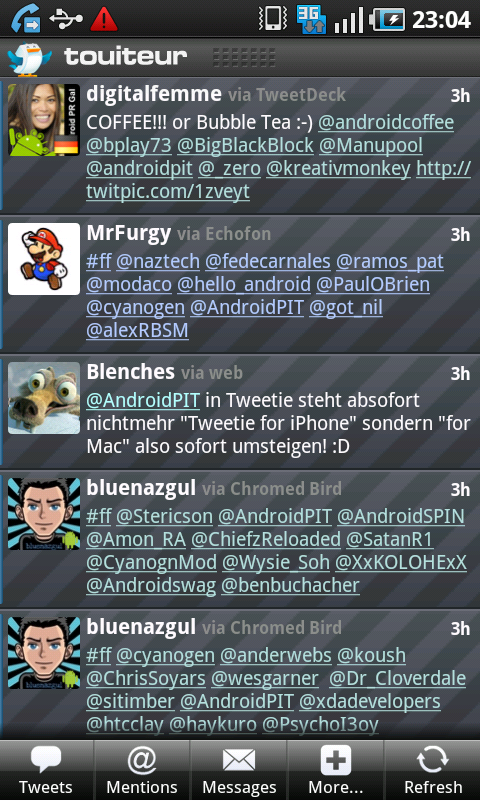 Mentions: displays any mentions of you in other people’s tweets. Messages: All private messages between Twitter users. Reply: Answer tweets directly. Others can read this tweet in their Mentions. Links: All links from a tweet, including mentions are placed into a clean and easy to read list. The breadth of functions available on this Twitter clinet is very good. No big suprises or innovations, but a solid 4 stars nonetheless. The great user interface is what makes Touiteur my new favorite Twitter client. Not only does it look good, but it is also intuitive to use. 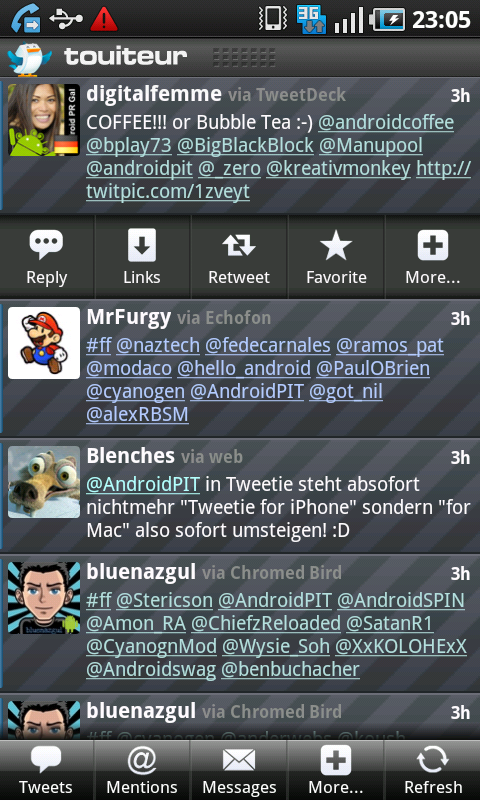 Many Twitter clients for Android that I have seen in the past cannot compare to this one. If you consider how well-done some of the Twitter clients for the iPhone are, you have to admit that the Android versions are not on par. It’s reassuring to see steps being made in the right direction with Android apps such as Touiteur. 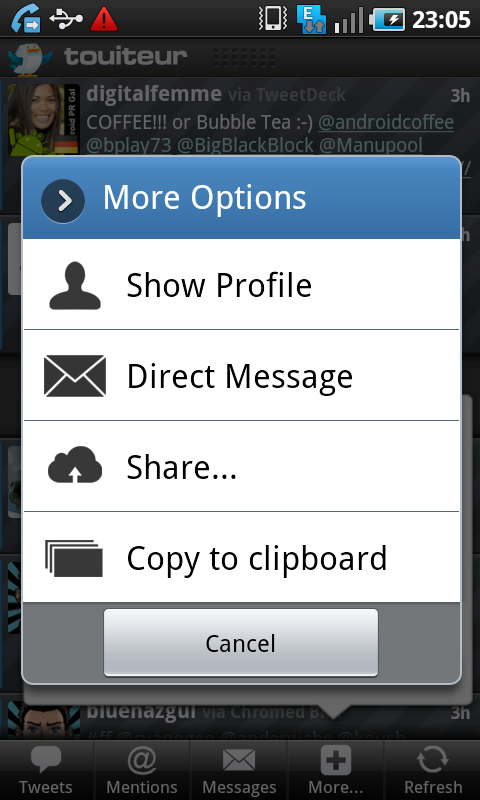 This shows that it is possible to develop beautiful and intuitive user interfaces for Android, as well. That’s why this app deserves a full five-star rating! Touiteur runs fast and without any lags. Touiteur is available in its light version from the Android Market. it wont let me add my account it keeps saying the authorized link cant be created, my time zone is right my connection is good and i didnt revoke it on my twitter account , a little help here? i can't install the update :( ive already downloaded it but everytime i try to install it, it says 'application not installed'. please help. i'm using a samsung galaxy tab. I already gave it a 5 star. Hope the DEV continues great work on Touiteur as it's my favorite Twitter app to date! This is a top grade app. The dev should be very proud of their work. Highly recommended.